Yeast starters offer higher cell counts at the time the yeast is pitched, leading to faster, healthier fermentations and better tasting beer! You may be wondering how to make a yeast starter. Well, lucky for you this kit contains everything you need for making your own yeast starter right out of the box, including step-by-step instructions! This is the most common size used to make yeast starters using liquid yeast, great for higher alcohol beer and cold fermented lagers. In the lab world, these flasks are known as "Student Grade," meaning there may be some cosmetic flaws in the glass, and the volume measurements are approximate due to variations in the thickness of the glass walls of the flask. This makes it a great flask for making yeast starters--at a great price! We do not recommend the use of an electric element with these flasks. If this cannot be avoided, we suggest using a larger pot as a hot water bath on the stove. I the kit was cheaper than buying a flask and DME separately. Interested in using starters to reduce the amount of yeast I have to buy. In case the liquid yeast was hurt by high temps in transit. Splitting a 10 gallon batch means I need two starters. Need to up my game. I needed all three of these items. Needed for first yeast starter. Does this kit com e with foam stopper? BEST ANSWER: The kit I received did not have a stopper included in it. No, it does not come with a stopper. Making a starter is super easy. Should have done this along time ago. I recommend buying or making a stir plate too. Works as described. My beer has drastically improved with proper yeast starters. Everything I needed to get a batch of yeast happy and growing... And at a great price! Perfect size for five gallon batches. Nice quality flask and everything you need for a medium sized beer. This is my first yeast starter kit and I have been pleased with the quality of product that I received. I do recommend this product and also you need to find a good yeast calculator online that will give you specific measurements. I follow the instructions as written except i boil the ingredients in a different pot then pore the boiling wort into the sanitized glass container to prevent boil over. Gives me the volume I need and works great on a stir plate. I'm a first-time brewer who did a ot of research beforehand. I used this kit with a liquid yeast pack and WOW did it take off. I did not experience any boil over or foaming , and I did not use a stir plate. All is used was the kit, the packet, and filtered water. I had read that there would be little sign of yeast activity, but after 48 hours my starter was happily bubbling away. I brewed today and checked my fermentasaurus after a few hours and found it pressurized to the limit already. I thought I had a day to make my spunding valve, but it became a priority. This kit is your foray into understanding and manipulating yeast. I pitched my first starter last night, and this afternoon I can already say I will never direct pitch yeast again! The last batch I brewed (direct pitch) had a lag time of over 24 hours. With the starter, I had a fully active fermentation in less than 12, and the bubbling from my blow off has never been more vigorous. I wish I had purchased a yeast starter kit much sooner, as I'm sure I could have been getting way better results when I was still extract brewing. However, the instructions for making the starter could be better. The instructions and included DME are for making a 2L starter..... in a 2L flask. This is probably ok if you boil the starter wort in a pot and then transfer to the flask, but the instructions led me to believe I could do the boil in the flask directly on my gas range. Having tried it, I honestly can't imagine how you can bring 2L of starter wort to boil in a 2L flask and NOT have a boil over. Luckily I saw it coming and was able to safely move the flask to the sink just before it boiled over, narrowly avoiding what would have been an incredible mess. I was left with about 1600ml after the boil over, moved it back to the flame and was able to keep it boiling without any other issues. So maybe this kit should be sold with enough DME to make a 1600ml starter instead of 2L, or the instructions should encourage you to boil the starter wort separately. Personally, I wanted to boil inside the flask to be sure it was completely sterilized. Also be aware that although you're supposed to use the entire package of DME you are NOT supposed to use the entire packet of yeast nutrient. Whoops! When I realized what I'd done I called down to MoreBeer and the customer service rep assured me that the starter would come out fine, but I should probably put the starter in the fridge the night before brew day and decant it before pitching. Thank you MoreBeer for having great advice and knowledge that's only a phone call away! After boiling for 15 minutes I topped the flask with foil and transferred to ice bath, trust in the borosilicate glass! Having the wort in the flask at this stage is great because you can easily pick it up (with oven mitt) and swirl the wort every few minutes to help with the heat exchange and cool the wort faster, all the while keeping it covered and protected from outside contaminates. Once it was cooled to room temp I pitched the yeast and put it on my stir plate. Definitely recommend investing in a magnetic stir plate. So easy to use, set it and forget it. After 24 hours on the plate and 24 hours resting, I had a nice big yeast cake at the bottom of my flask. Put it in the fridge the night before brew day, decanted, and pitched. Hands down the best upgrade I've made to my brewing kit. Stop waiting and start making starters! I am still relatively new to homebrewing (about 6 batches), and just switched to liquid yeast for my last couple batches. I was noticing a lot of caramel flavor in the beers, likely from underutilized sugars. My gravities seemed to be right, but I felt that I must be underpitching my yeast. I got this kit along with the oxygenation kit, and the fermentation on my last batch was well beyond any of my prior beers. In fairness, it was probably overpitched this time. I made a 1000ml starter, and was not sure if I had healthy yeast or not. I used an airlock, and while there was activity in the flask and bubbles when I swirled it, I never saw it bubble like it does on a carboy. After a couple days, I dumped off the fermented liquid and repitched in a new batch of wort. This time the starter went crazy. It's hard to say if the more active fermentation is more due to a fully oxygenated wort, or the increased cell count from the starter, but it's the first time that I have had an airlock filled with yeast. My batch yielded about 4-1/2 gallons in a 7 gallon Fermonster and the krausen filled all the headspace and then some. Hopefully overpitching won't ruin the batch, but I know I won't have to worry about underpitching again. My only gripe is that I wish it had more volume markings. There is not a marker for 1000ml, and guessing where it should be given the conical shape of the flask is a crapshoot, so I'll have to do it myself. I typically make 1200ml starters (10g/100ml) and this thing is perfect. I have used it dozens of times and went straight from my gas burner on my stove to the ice bath in my sink. Do not use on an electric element type burner. Funny story and a warning to those who may have yet to experience this: I was attempting to sterilize my stir bar during the last 2 minutes of my boil inside my flask. Let's just say that is NOT a good idea!!! The moment I slid my stir bar into the flask down the side, it erupted into a cone of boiling wort all over my vent hood, stove and floor. It was hilarious since I managed not to get burnt. What a mess!!! You have been warned! Before theis kit I was using some random bottle for starters. More comfortable using this piece of glass wear. If you're making a lager for the first time you are likloey to under pitch. You will need this starter kit to make sure you are pitching enough. I highly recommend it. Nice to have but consider a 5000 mL over a 2000 mL. Best Price on the Net ! I enjoy being able to add direct heat (gas stove) to my erlenmeyer and quickly cool in an ice water bath with no worries. Fastest way to get your yeast starter going. I only regret I did not get a 5000 mL size. MrMalty.com suggest I use a 3000 ml starter with my aged Wyeast smack pack. I need to at least buy a second 2000 mL sized erlenmeyer to brew beers over 1.060 OG with a 3 month old yeast packet. Might be better to have two 2000 mL flask if you want to cill the starter in a refrigerator to flocculate the yeast quicker or store your starter a couple extra days. The two 2000 mL size flasks will fit better in the refrigerator next to the milk jug. This will really improve your beer quality. Kit has everything you need to make a great starter. I'm happy that I finally broke down and purchased this kit. The 2 batches I have brewed since using a starter have had a much more vigorous fermentation. I like the fact that I now have a the ability to make starters reusing my yeast. I'm cheap, and enjoy pinching every penny I can. You're really doing your beer a dis-service by not making a starter. This will ensure you have enough healthy yeast to chew through the fermentable sugars and make great beer. 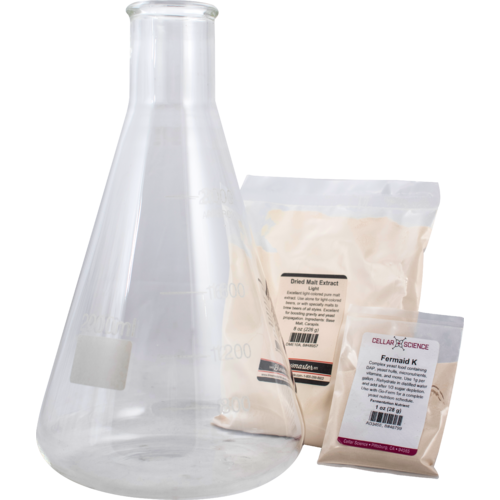 This kit is a great place to start for yeast starters...just pair it with a stir plate and you're all set. Pitching the right amount of healthy, hungry yeast cells made a huge difference in the quality of my beer. The 2000 ml flask is more than large enough for most of the styles I like to brew. I typically only need an 800 ml starter for my pale ale (1.050 SG), but I'm glad to have the extra room when I brew something stronger. This kit makes it easy to get started making starters. Used this 3 times so far. Really kick starts fermentation. After my first batch, I started doing 1000ml batches to try to avoid boil over. I am so happy I bought this, it has helped with many batches I have brewed. Definitely a recommend to any brewer to have. love using this kit to get great yeast start, noticed immediately that my yeast got a much quicker start. Starters are a must when brewing. It's best to cut down on the lag time before the yeast kicks into gear. This beginner kit is a great price and the flask is the perfect size for most 5 gal batch starters. It may be a little on the small side for some lager starters but great for most all ale batches. Grab a stir plate while you're at it to give the little guys a hand. Making a starter before pitching yeast is about the most important thing a home brewer can do to ensure healthy fermentation (sanitation and temp control are the other important facets). The Erlenmeyer flask make the starter process really easy b/c you can heat and cool all in the same device. Highly recommended. Great starter kit but would be nice if the DME and Yeast Nutrient were in resealable bags. Would definitely purchase again. Fermentation start fast and strong. Nice starter pack. Making starters with this kit is incredibly easy. The 2L Erlenmeyer flask is the key. I boil DME, a little yeast nutrient and a hop pellet (or two) on the stove, right in the flask. Cover with sanitized foil. Allow to cool. Pitch yeast... It's hard to imagine an easier process. I have recently discovered the advantages of using a yeast starter and I will never go back to direct pitch again. Fermentation starts quicker, works harder and produces great beers. Learning how to do it is easy and you won't be disappointed with the results. Put it on a magnetitic stir plate for best results. Don't fill more than 1750ml. first time making a starter and this kit had everything at a decent price. I would recommend it. Great kit for the price. Comes with everything you need to start using liquid yeast. It's nice to get everything you need all in one kit. The flask is a nice size to handle larger starters but I usually stick to around 1000 ml for most 5 gal batches. This kit makes it really easy to get "started" making yeast starters. It has everything you need, and the info to get you going. After that you know what you need, and how to do it. great place to start for a rookie brewer. I ordered this after finding how improved my fermentation went after making a starter. My first attempt though I used a small container. This is just the right size for a five gallon batch. This kit contains a flask that should last years. It's heavy duty and will take a bit more bumping around that those available elsewhere. Great gear at a great price. This is one of the best brewing investments I have made. This kit has saved me tons of money on yeast. You can reuse the yeast over and over (as long as you keep it sterile) and you don't have to spend several dollars on yeast for each brew if you use this kit and save some yeast for the next batch. Used for the first time with a new Stout and the results were startling. Fermentation took off with in three hours. Bought the 2000mL even though I planned to only make a 1000mL starter and was grateful for the additional volume. Flask fits nicely on the stove burners and gave some extra volume for the boil. Made a starter 36 hours before brew and swirled by hand as often as possible (no stir plate yet). Yeast took off quickly and vigorously within hours. Recommend highly. Will add a stir plate eventually but the results without were still impressive. There is absolutely nothing wrong with the materials in this kit. However, the instructions for adding 2 cups of DME to 1800mL of water (even with 15 minutes of boil time) are silly. That is too much volume for the 2L flask. The krausen from EVERY starter I made following these instructions filled the flask and leaked out the top making a mess (I use a sanitized aluminum foil top). So I suggest either make a smaller amount of wort or attach a blow-off tube. A 3000 or 5000 ml flask will greatly reduce boil over for a 2000ml starter and make it overall easier, I never use my 2000ml flasks for starters larger than 1200 ml anymore. Seems like a 2000ml kit name implies it is suited for making a 2000 ml starter with it, and that is not so with a 2000ml flask in my opinion. The only problem with larger flasks is that some stir plates do not deal with them very well. I don't know why I never did this before. Yes I do I was ignorant. I use these to make starters and I also use these to make huge yeast banks. I simply take my yeast and make my starter. Even if I don't use the yeast for a couple of weeks. I make the yeast and then dump portions into preform soda bottles. Then I make my starters again when I have my brew day. Its awesome!! This really changed my attenuation and efficiency. I just did an IPA and the yeast had my wort fermenting in just over 3 hours from pitching. It was a drastic change from the 24 hours it took for my previous beers before using a yeast starter. Why not? Its one of the last keys to successful batches every time. Don't forget to put the DME in first before the H20 - or its gets all stuck in the neck. First one I made we had a power outtage. When it came back on, the magnetic stir bar wasn't centered and WENT CRAZY. If only I was home......When I returned it was an utter disaster area in the dining room with most all of the starter frothed out on the table and floor. Hint - more is not better when stirring. A nice gentle vortex will get enough O2 in there. Picked up one of these kits awhile ago. the home brew is tasting better, more complete fermentation, and it is cool to be able to see fermentation start in the carboy the same day as brew day. I was drawn back to microbiology courses when I turned my kitchen into a yeast lab! Starting a culture was quite simple and straight forward. I attempted a double boiler method, which was not that effective. I recommend cooking the yeast over a gas flame if possible - I purchased a small butane burner for about 30 dollars for this purpose, like those used in brunch buffets for omelet bars. I got this kit through the deal of the day and it was probably the best purchase you can make when getting serious about fermentation. This product cannot be beat for the price. You get a very nice 2L flask and all of the fixings to get you and your yeast starter at a low price that is often the cost of a 2L flask at your LHBS. Highly recommended! Got this kit and a stir plate and tried my first couple of starters and MAN what a difference! Even slow starting yeasts at low temps get rolling fast. I'm a convert. Yeast starters are so easy, and greatly increased the quality of my beers. I definitely recommend doing a starter for every batch. Must have for anyone doing 10g or high gravity brews. You will likely need a larger 5000ml flask for lagers or high gravity 10g batches but this kit is a great start. Couple this with a stir plate to make great starters that will bring your beer to the next level!